As the summer winds down and school starts up again, we’re hoping you can find the time to help us add to the Carequality Interoperability Framework. As adoption of HL7’s Fast Healthcare Interoperability Resources (FHIR®) Specification continues to gain momentum throughout the healthcare industry, we at Carequality believe we’re in a great position to help advance this cause. With much of the healthcare industry either starting to implement FHIR at some level, or planning to do so, we believe it’s a good time to start thinking ahead to the type of broad, nationwide deployments that Carequality governance can enable. We are, therefore, adding FHIR-Based Exchange to our existing Query-Based Document Exchange Use Case model, and are seeking volunteers for two new workgroups that will extend Carequality’s governance Framework to the FHIR exchange ecosystem. The overarching goal of any healthcare interoperability project is to improve outcomes, lower costs, and/or broadly improve overall population health. We believe that adoption of FHIR in the Carequality Interoperability Framework can advance all of these goals by improving the availability of useable clinical information, expanding the scope of exchange, and significantly lowering the costs of participating in interoperable exchange. FHIR offers a number of new capabilities, relative to health information exchange that relies on SOAP web services to retrieve CDA documents. Data elements, or ‘resources’ each have a tag that acts as a unique identifier, just like the URL of a web page. These resources can be used to build chart elements, one data set at a time. This allows an end-user the flexibility of targeting specific data instead of having to sift through a whole document to find what they are looking for. This flexibility is not only welcomed by current players in health IT, but should ease the way for many new entrants, serving various stakeholders including patients, providers, and payers. A combination of great flexibility and adoption by many players will clearly have great value, but can also lead to challenges in the absence of unifying governance that includes policy guidelines and ultimately provides a single on-ramp for users. Carequality expects to work in concert with many other organizations playing a variety of roles. We do not intend to duplicate the great work that is underway on multiple fronts; including defining FHIR resource specs and associated use case workflows. Instead, we will focus on the operational and policy elements needed to support the use of these resources across an organized ecosystem. Please come take a seat at the table to help make this vision a reality! 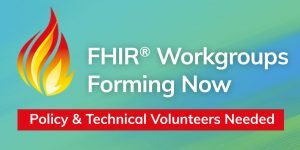 If you or someone from your organization is interested in participating, please send an email to admin@carequality.org with the subject “FHIR Workgroup Volunteer”, inform whether you’re interested in the Technical or Policy workgroup, and briefly describe your qualifications. We’re soliciting volunteers until 5:00pm PDT on October 26, 2018.